I finished taking Christmas down a lil' over a week ago. Our living room looked really bare but I just was not inspired in the least. Nothing was coming to me. Then last night at yes, 1:30 am as I was walking by the fireplace after double checking to make sure the doors were locked it was like a light bulb went off in my head. My mom gave me this wrought iron tea light holder for Christmas. I could not figure out where I was going to put it and so it wondered around the house for several weeks. I think this is a good spot for it! I also decided to place my Boxwood HomeGoods topiaries that I purchased a few weeks back here as well. Next I pulled this scrolly resin piece and added it to the front of the mantle. It had been residing in our lil' art niche which now is in need of a make over. I took some of the same elements from my fall display and used them for this display. You just can't go wrong with vintage shutters. Next I wanted to keep the round theme going so I brought back in the two taller topiaries. I also brought back in the old world style book ends. I just love those! My Kirklands pillow that I purchased sometime last year came back out to sit on the frenchy chair. And I decided I Iiked the frames from my Christmas display so they stayed too with the addition of the scrolly frame which guess what is just a plastic frame from HobLob that was only $5 and I painted it! It use to be white. I love how simple and uncluttered everything looks. It is a refreshing change from Christmas. The best thing is is that it cost me nothing! I absolutely love it. Great job Pamela! I have been also playing around with my blog design and still in transition mode - fun and frustrating at the same time. I agree that the blog designers definitely earn their keep. Have a great end to a beautiful weekend. That looks great, Pamela! Sometimes I think the best ideas come to us when our mind is clear. The ideas just flow in! Love the shutters off the side, too. I need to get a pair of them for my mantel. Love the frames ~ $5.00 at Hob Lob? Love the applique, too. Is that temporary or permanent now? You can sit back and enjoy this now. I think your set until Spring! That looks like the perfect spot! I've been struggling with an "after Christmas" look too. My house seemed so stark once everything was put away, it was kind of depressing. You did a fabulous job, Pamela ... looks wonderful !! What a fun gift from your Mom. And, I'm super impressed that you did this so late at night, too !! Your mantel is absolutely stunning. I love it. The topiaries are unreal and the shutters are such a great idea. I really like the frames leaning against the side of the fireplace too. I think you did good. I have my wheels turning like mad also and right now I havn't come up with anything. I don't know why, but it all seems a blank. Looks wonderful! And I love your blogs new look too! Looks great Pamela! Love the topiaries!! Everytime I look at your fireplace, I fall in love with the stone all over again! I'm stopping by again to let you know I have featured this post today over at Scribbles and Swirls. Come over and take a look http://tamiscribblesandswirls.blogspot.com/. I hope you like it and follow along as well! Thanks for the inspiration! Totally beautiful! I just love every element! Some of my best inspiration strikes at odd hours. I love the way you designed your mantel. The decorative scroll was a great idea, and so was everything else. It looks great. each detail enhances the next. Love it Pamela! You pull things together so nicely, I like how you added the scroll piece to the front of the fireplace, and I love anything that is boxwood lol. 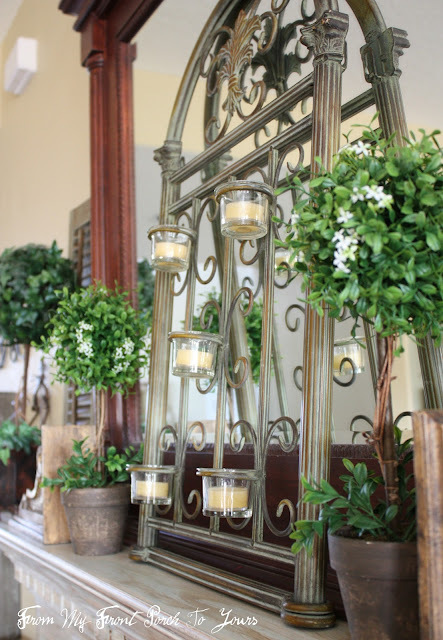 The candle wall sconce over your french chair is so pretty! Have you ever thought of painting the large dark wood mirror a lighter color? I love what you did with the plastic frame, it looks great! Very pretty, and such a great way to put it together! You sure can pull a great mantle off. Got to head off to Homegoods to see if they have anymore of those globe boxwood. Also really love the addition of the shutters. Thanks for sharing your creativeness at Sunday's Best. Great job Pamela I love it!! Sometimes it's the middle of the night when the light bulb goes off for me too:) Love your frenchy chair! Looks great and I was awake at that time last night, too. I had too much on my mind. Wow! I love it! It looks so fantastic and beautiful. Looks great Pamela! I don't know why but my mantle is the absolute HARDEST thing in my house to decorate to my liking! Love the way your's turned out! Everything is looking wonderful there Pamela. It is fun to tweak our blogs and our home and get our creativity flowing. Gorgeous! Love the topiarys and shutters too. I have a shelf begging for something nice and you've provided some great inspiration! Thanks. Love the frames on the floor next to the fireplace...neat idea Pamela! The mantel looks like it should be in a magazine! Thanks for stopping by loved having you! Very pretty and elegant! You chose the perfect place for the tea light candle holder. Truly gorgeous. Thank YOU for participating in our Show Off Your Cottage Monday and bringing us here! As Always you rocked it!!!! Love the chair next to your fire place!! And adding the scroll work was a great touch! I'm with Kathy. I just love those shutters!! Beautiful fireplace. Your mantle looks lovely! I especially love the corbels. Very pretty. 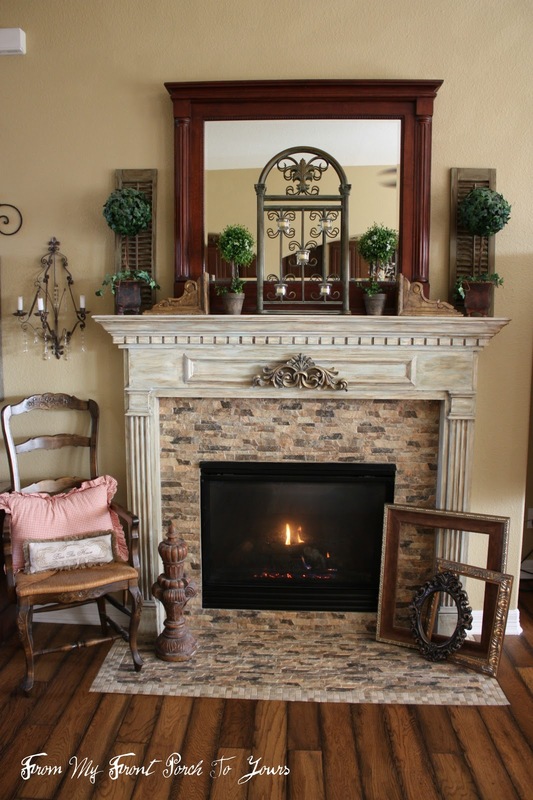 Love how pretty your fireplace mantel looks. Your french style chair next to it looks so cute too. Thanks so much for stopping by and commenting too! Look at you quick fingers first one to the party. Thanks for joining. Great job Pamela, isn't it funny how inspiration strikes at odd hours? Very nice fresh look for the new year. Vintage shutters are a favorite of mine. They always look good in a vignette. It looks so pretty, Pamela. You kept it simple, but it looks elegant! You created a very warm and inviting mantel. All of the elements look great together. I'm inspired! I agree - very warm and inviting. You did a wonderful job finding a home for the candle holder. It looks perfect there. And the other elements you added are just perfect too. Great job! Great looking mantle ! How did you manage to be first? That's a feat in itself. I love all your elements on your mantel. Absolutely beautiful! It looks like out of a magazine!